I am now the proud mother of two adults! 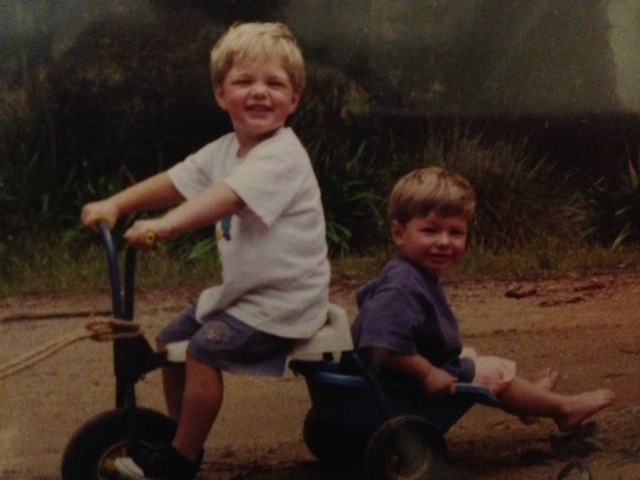 No longer “men-children”, my twin boys turned 18 this week, which naturally causes one to reflect on the journey so far, and to be so thankful that we all made it through in one piece, relatively unscathed, but with plenty of stories to tell along the way (the blog thanks you both). Father of a Man-Child and I, along with their little sister, made quite a fuss on the day (as much as we could when we all had to go to work and school). Presents, heartfelt cards from each of us, dinner of their choice, birthday cake – it’s not every day you turn 18, and we think they felt special. Of course the best birthday present anyone could get is their car licence, which one managed to achieve on the day. He was beside himself with excitement when he got to take the car out for a spin with a mate that night. I am sure we can all remember the giddy sense of independence, freedom and power (and perhaps a few nerves) that goes with that first drive on your own. His brother sits his licence next week, and can’t wait to join the club! As my Father-in-law commented the other day, we all seem to be in a good place – and he is right. Our boys have travelled across the adolescent bridge, and made it to the other side. For those who don’t know Celia Lashlie’s book He’ll Be OK, she describes adolescence as a journey across a bridge, with no mothers allowed! I have done my best to stay off the bridge as much as possible, whilst providing the safety net below, and yelling instructions from either end! It’s not an easy task to let your children go, but as I reflected the other day, I realised that we had slowly but surely given them more rope, as they inched across the bridge, giving them a bit more freedom over time, until finally they reached the other side. It happened so organically, we didn’t really notice until we all popped our heads up and presto – they made it. Whilst tension remains in our house from time to time (we still argue with them, they still fight, we still disagree on some things), they have certainly matured this year in particular. Perhaps it comes with the beginnings of their adult life, and starting to establish themselves, their identities, their paths towards careers. One man-child is doing year 12, focussed on working hard, getting good marks and heading to uni next year to do a course of his choosing. He is also focused on his sport (rowing and footy), showing incredible dedication, and making many sacrifices to be a part of their elite crews and teams. He deserves all the success he is enjoying, given his work ethic and commitment, and we are incredibly proud of all he has achieved. His twin brother, having left school to achieve a TAFE qualification in Building & Carpentry, has now secured himself an apprenticeship and we couldn’t be prouder. He applied for the job online, had an interview, completed a trial (it only took two days for his boss to realise he’d found a winner), and was offered an apprenticeship last week. He beat 100 other applicants in a tough market, and has thankfully been employed by a genuinely nice bloke, who will treat him well and invest time and energy to teach him further skills. So to my once beautiful baby boys, who we were so blessed to welcome into the world 18 years ago, so perfect, so gorgeous, bringing us double the joy and double the love, Happy Birthday. You are a gift we are thankful for every day (just like your sister), and we are incredibly proud of you both and will love you forever. I don’t always read your blog as I don’t have children so not always relevant to me but glad I read this one. You sound very proud & happy, good for you. Thanks JLo. Yes, a happy place (I can hear Pharrell Williams song in the background). Thanks Lou. :). Who knows where it will go. Whilst there is still material i will still blog!